It's nothing, right? Just an old dusty fragment from the bottom of a closet. Hard to read much from it one way or another, and certainly not worth much time researching. Right? David Featherstone: The first picture we're going to look at comes from this period of Watkin's early work as a photographer, when he was in the San Jose area, but it has not been clearly established that this was made by him. It is a fragment of an ambrotype, which is a positive image made on glass. Peter, you've established some evidence that may attribute this to Watkins. Peter Palmquist: Basically, it involves the fact that Watkins was in San Jose and connected with James M. Ford. If we are looking at this as possibly teh earliest artifact that can be attributed to Watkins, the connection has to be tenuous, but there is a succession of evidence that suggests it's highly likely. If this is not by Watkins, it is probably by Ford, but the latter was away for long periods of time. One of the competing photographers in San Jose talked about the success that Ford had at the state fair. He referred specifically to the quality of work of a man Ford employed on and off. This infuriated the other gallery owners, who said, "This isn't your regular employee." I believe this is a reference to Watkins. Weston Naef: This picture has been identified at the Augustin Alviso ranch, which was in the southeast part of the Bay Area, near Newark. Its association with Watkins is based on a series of circumstantial associations with a handful of other surviving photographs. These contain some common threads that are so slender that it's hard to imagine we could begin to identify this particular picture with any known maker. Stranger things have happened in the history of art, however. For example, some of the greatest vase paintings of ancient Greece are attributed to known makers on the basis of tiny fragments, where the visual sensibility of a maker is so clearly evident that a consensus of opinion comes to be formed that a fragments can stand for the entire work of a maker. Peter Palmquist: This came from the Alviso family. It has always been known in the family for what it si and remains the only imge of that particular sites. It is a full plate, and full-plate ambrotypes are rather uncommon. Amy Rule: Are there some ambrotypes by Ford that have been identified? Peter Palmquist: There are some that are attributed to him, but nothing has been demonstrated absolutely. None are of an outdoor nature. Tom Fels: If you try to picture this as a whole plate, while it's certainly typical of its time, it has some things that we might agree are characteristic of Watkins. It has a kind of clarity and stateliness in the presence of the building, for example. I couldn't say that it's Watkins, but that's not a bad place to start. Weston Naef: To go one step further with what Tom is saying, what makes this so promising is that we are seeing evidence of a major event. If you look along the balcony you'll notice that a number of people are posed there. There's a wagon in the foreground. perhaps most important of all is the arrangement of the three horses: one looking forward, one looking to the right, and one looking to the left. We're seeing here that someone had enough charisma to orchestrate a courtyard full of people and animals into a setting of his wishes. We know from other work by Watkins, particularly his landscapes around the Bay Area, that he was a master at placing figures in landscapes. When I first saw this fragment --and I tend to be pretty skeptical about such things since everybody wants to read something into the unknown-- I felt that is was really uncanny. It somehow had the mark of mastery, and there were not very many people working in photography in the southern Bay Area who had this kind of mastery. It could have been Ford, but we assume that he was a specialist at photographing indoors. Watkins had begun to establish his own identity as someone who was particularly gifted at working with situations in flux. 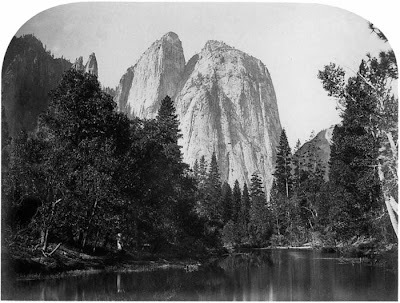 David Robertson: If you look at the way the trees are orchestrated against the background rocks in the 1861 photograph River View, Cathedral Rocks, which we will discuss later, you come to the conclusion that Watkins chose that particular view very carefully in order to produce a syncopation of rocks and trees. In this photograph, if you look at the arrangement of the horses and the people and the wagon and the building, you see the very same care to spread things out so they establish a rhythmic counterpoint. Weston Naef:Peter, can you talk a little more about the role of the wagon? It has appeared in other very early and exceedingly rare photographs and therefore establishes a common thread that cannot be ignored. Peter Palmquist: There are six images we are aware of that were made in the is general area, and in four of them this same wagon appears. Of the six images, Watkins subsequently copied or manipulated four of them, and they appear in his work thereafter. Amazing the inconsequential things some people will waste their time talking about, isn't it? You'd think they'd have better things to do. I almost agree with you nick. Too much talking can be a waste. But If we never "wasted our time" on the inconsequential (shooting the breeze with friends, making jokes, wondering around with a camera taking photos of things that interest us, etc., etc.) life would be an empty path, robotically trodden to a dull and drab end. Three cheers for the seemingly inconsequential! Well, in this case the seemingly inconsequential turns out to be loaded with meaning. Perhaps this is a reminder that everything out there has meaning when given proper context, which makes the decision of where to direct one's attention all the more important. 'Inconsequential' is fine m and B, but it seems to me that here it's been turned into a gratuitous exposition of supposed erudition - but about something SO inconsequential out here beyond the borders of that erudition as to make the result slightly funny, but otherwise meaningless (but no offence meant to them, honest, if it makes them happy! ).